Organic foods are good start to making a way to healthier life. Before moving to the list of organic foods, let us see what organic foods are. Well, this depends on the way these foods are grown. Foundation lays an important part in determining the real character of the fruit. 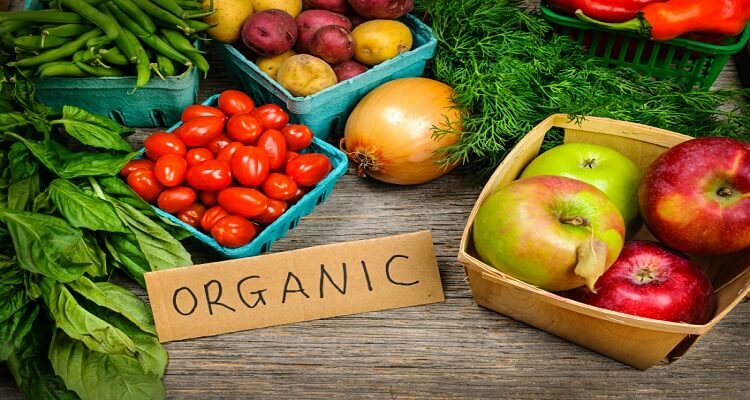 Well, organic foods are the ones grown in safe soil, with no modifications, no pesticides, no bioengineered genes, no petroleum based fertilizers, and no sewage sludge-based fertilizers. The organic foods are healthy for the body. Potato is the king of veggies. But, it is not free from contamination in the conventional method of growth. It is really saddening to see that chemical treatment is quite extensive in the conventional growth. During the growing season, potatoes are treated to avoid being the victim of fungi; then before the harvesting season, potatoes are treated with herbicides to kill fibrous vines; and then after being dug up, they are again sprayed with chemicals to avoid being sprouted. It thence, becomes necessary to choose organic potatoes. We all love this fruit- cherry. It has a wide application in our daily life, from fruit to cakes and pastries to jams to pies and many more. But beware! The conventionally grown cherries are sprayed with pesticides 8-10 times during the growth cycle. Even being washed, you cannot be sure of being free from these pesticides. To avoid the residue and any doubts in your mind, go for organic cherries. You might pay a little extra for the organic ones, but they are worth the expense. Pests love the bell peppers. They find it worth and so does we. However, to protect the peppers from the pests, pesticides are sprayed. According to the Pesticide Action Network, sweet bell peppers are sprayed with 49 probable carcinogens, out of which 9 are human disruptors and 9 are neurotoxins. I guess, none of us is interested in these chemicals. Therefore, it is worth paying for the organic peppers. Cucumbers work as a great salad food, good for skin, eyes and stomach. However, there is a difference in the ones grown tradionally and the latter being organic. Organic cucumbers are low in calories, carbohydrate content and dietary fiber. However, vitamin and mineral content in the organic cucumbers is higher. Though the difference is not huge, but it is noticeable. Moreover, the organic cucumber has a better taste. Love grapes? Try organic. Grapes are often contaminated with highly toxic methyl bromide. though, grapes grown in U.S. are tested for low residue. But you cannot be sure about the ones which are highly contaminated and the ones which have low residue. If you are taking the grapes for your small children, then definitely, you should go for organic. Children love strawberries. But wait, are they eating just the strawberries or even pesticides? If you want your children to enjoy taste and health both, you ought to spend a little more. However, even conventionally grown strawberries are expensive, but they have lots of pesticides and insecticides over them. At least, you will get what you are paying for, if you go for organic strawberries. It may not be the case with traditionally grown ones. But be sure! Popeye the sailor man. Pon pon. Remember? I guess, most of us have watched this cute cartoon in our childhood. Many must have started eating spinach after being inspired by the show, as I did. Well, this green veggie, rich in vitamin A, B6, C and K, calcium, phosphorus, copper, iron and folate, is even loved by the insects. Therefore, up to 57%of insecticides are sprayed on this. Therefore, chose organic spinach than the conventionally grown. This low calorie vegetable is rich in vitamins A,C and K plus folate, manganese, potassium and dietery fiber. Thorough washing and cleaning of celery, will not wipe out the pesticides, found on almost 90% of the traditionally grown celery. Therefore, go organic. Peaches are rich in beta-carotene and thus very beneficial for eyes. Peaches have many other qualities such as they act as cancer fighters, cleansing kidney, a great aid for weight loss and work as antioxidant. But, they are grown very dirtily. According to USDA, 98% of peaches in the market are contaminated. In order to extract its benefits, pay extra but do not compromise with your health. An apple a day keeps the doctor away, and when the apple is organic, it is much more useful. Actually, the apples are low in sugar and high in fiber, adding to the nutrition in your body, without any calories. Apples are even good for cooking and baking. Obviously the pesticide are toxic. The direct link with these pesticides can cause skin diseases and cancer. Since apples are one of the fruits more prone to insects, therefore pesticides are used in large quantities. Avoid inorganic and go for organic.